It feels like a long time since I last made these studs. 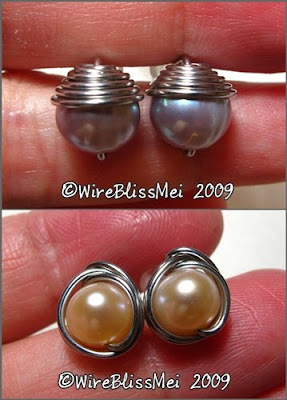 Finally two new pair of pearl stud earrings based on my top wrapped and simple but elegant methods. They are wire wrapped with only a piece of wire (each side), no soldering or gluing. They are really fun to make and will make great gifts...especially last minute gifts. Great earrings Mei...will check out the tutorials!